Dow Theory dates back to the early 1900s. It’s a simple way to define the stock market’s trend. 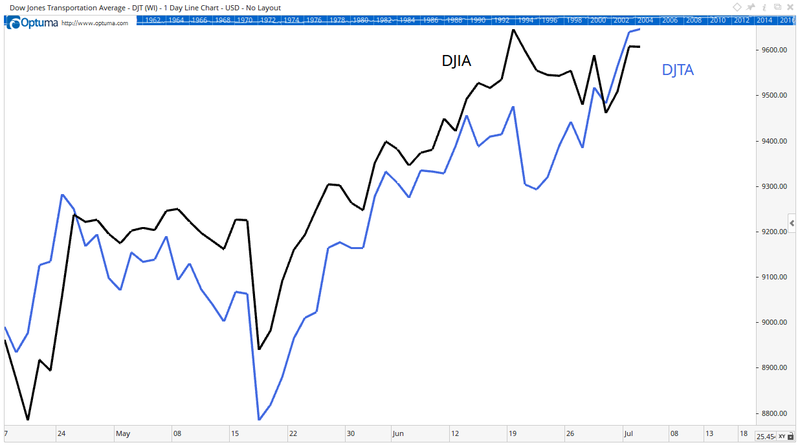 The trend is up when both the Dow Jones Industrial Average (DJIA) and the Dow Jones Transportation Average (DJTA) reach new highs. New lows in both indexes define a downtrend. With both indexes trading near all-time highs, Dow Theory says buy. Researchers have tested Dow Theory. Early tests, published in 1933, showed that the theory didn’t beat a buy-and-hold strategy. In 1998, a team of researchers claimed that this paper was wrong. They said the theory delivered better risk-adjusted returns. That later paper used statistical tricks. The researchers admitted that a buy-and-hold strategy beat Dow Theory signals by about 2% a year. But Dow Theory returns had a low standard deviation, and that meant risk-adjusted returns were better. However, returns still didn’t beat buy and hold after adjusting for risk. The researchers simply moved the goal line and announced that Dow Theory performed better under their new rules. The paper is long (46 pages) and includes a lot of statistics. So, many analysts read the headline instead of the paper. That’s too bad because there’s a surprise for those who read the paper. Dow Theory works best in bear markets. All “excess risk-adjusted returns” came during deep bear markets. Right now, we’re in a bull market. The Dow Theory buy signal simply confirms what we already know. But it’s late in the game for this bull market, and it’s time to be defensive. Believing the bull market has just begun can be an expensive mistake.